Sarangani bay is one of the most beautiful bays in the country. It boasts of a 230 km coastline. It is home to yellow fin tuna, and even sperm whales, pilot whales, and dolphins. Also spotted in Sarangani bay are whale sharks and dugongs (sea cows). Sarangani faces Celebes sea and is part of the coral triangle. It is a great place for scuba diving and even snorkelling. 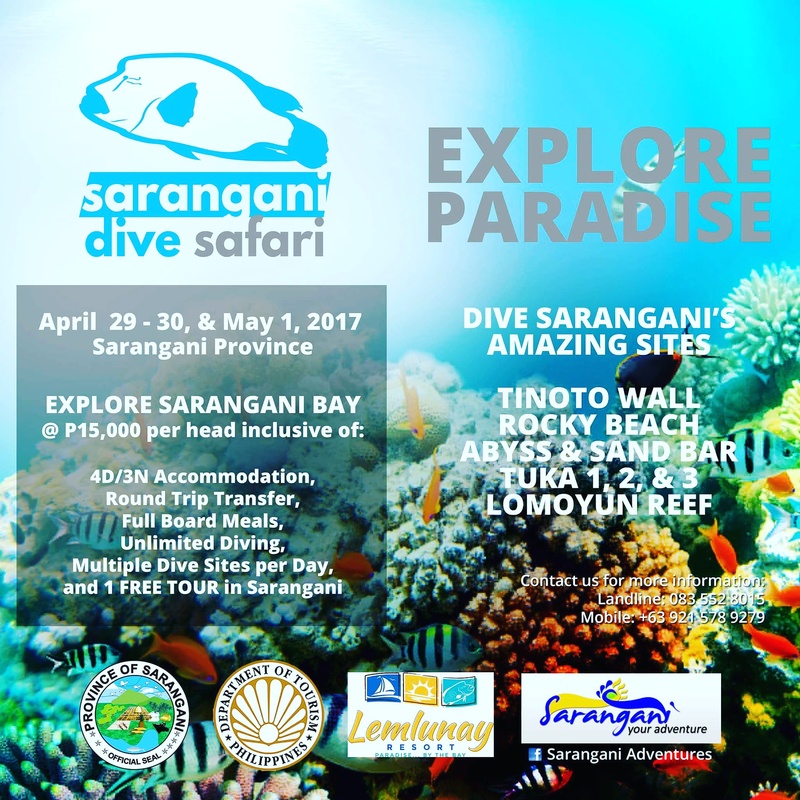 This Labor Day, the first Sarangani Dive Safari will take place. With the effort of dive operators and the local government of Sarangani Province, dive groups will be able to see the different dive spots with ease. The Dive Safari includes: 4 days and 3 nights triple/quad share accommodation, full board meals, unlimited dives, dive guide, tanks, and transfers from one site to another, plus a free tour! The best part it is promo rate of P15,000 all-in! This Is the best deal and the best way to unwind and enjoy on Labor Day weekend. For more information please email: gosaranganitravel@gmail.com or call 09215789279.